(Ottawa - May 11, 2018) The National Council of Canadian Muslims (NCCM) and the Canadian Civil Liberties Association (CCLA), two prominent civil liberties & advocacy organizations, say recently issued guidelines for granting exemptions under Quebec’s Bill 62 “niqab ban” are inherently problematic and do nothing to save a law that is fundamentally unconstitutional. Last October, the NCCM and CCLA filed a lawsuit seeking a stay on the application of Section 10 of the new law, which requires individuals to uncover their faces in order to receive basic public services, including healthcare, social assistance, and public transit. The Quebec Superior Court granted the stay in December pending the release of official guidelines for the requesting and granting of exemptions to the law on the basis of religious accommodation. The guidelines were released on Wednesday by the Quebec government. “These guidelines do not fix a law that is, at its core, discriminatory and unconstitutional. Requiring Muslim women who wear the niqab to make an application for exemption every time they wish to access basic public services such as healthcare and transit places a further undue burden on them. 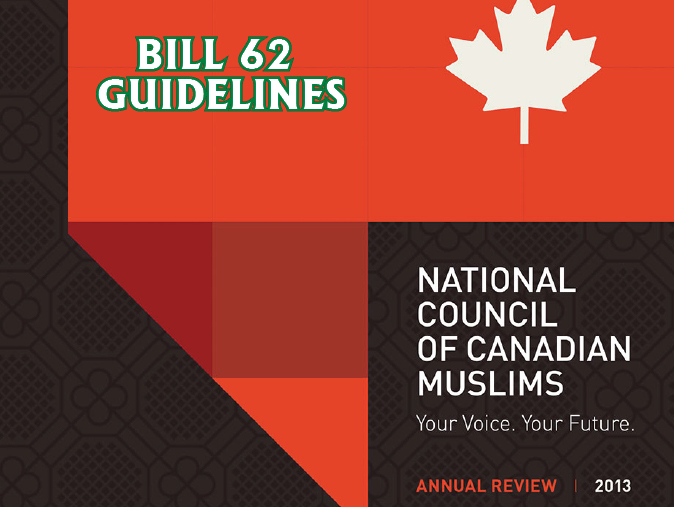 In our view, these guidelines only reinforce the convoluted and flawed nature of Bill 62,” says NCCM Vice Chair Khalid Elgazzar. “In the current socio-political climate, Bill 62 only leads to even greater xenophobia and prejudice against a minority group of Muslim women who are already stigmatized and stereotyped to no end. These guidelines do nothing to change this reality. There is no justification for the state to discriminate against one religion by targeting a small group of women within it under the guide of state religious neutrality,” says CCLA Executive Director Michael Bryant.